Localised demodex - this generally involves fewer than five lesions and is most commonly seen in puppies. Generalised demodex - involves 5 or more lesions and there are most commonly one or two areas of infection. It is commonly seen on the face and muzzle or two or more feet. Generalised demodicosis always requires treatment. Juvenile onset demodicosis occurs in animals under 18 months. Localised juvenile onset demodicosis usually involves a focal lesion. It resolves without treatment as the puppy's immune system matures. It is most commonly seen as a small patch or patches of hairloss. It is generally not itchy. It can occur anywhere on the body but is commonly seen on the head. Generalised demodicosis needs to be treated. It is thought to develop due to a defect in the immune system and it is advisable not to breed with these animals. As vets we normally recommend sterilisation once the infection is under control. Adult onset demodicosis occurs in animals older than 18 months. It happens as a result of something affecting the immune system. 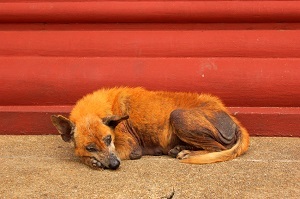 Predisposing factors may include immunosuppresive drugs such as corticosteroids, a high burden of other parasites, such as ticks, fleas or worms, poor nutrition and stress. In cases where a cause cannot be found, this is described as idiopathic. Some breeds seem to be more predisposed demodex skin disease. Rottweilers, Pit Bulls, English Bulldogs and Chinese Sharpeis have been found to be overrepresented. Generalised and adult onset demodicosis can become a severe chronic disease and animals may develop secondary bacterial infections. It is important to try and find the underlying cause. Some animals may require life long, chronic treatment, particularly in cases of idiopathic demodicosis. In localised cases there will be most often one or two small lesions of hairloss also referred to as alopecia. The patient may or may not be itchy. In generalised cases you may see hairless areas, redness of the skin, darkening and thickening of the skin, increased pigmentation and draining lesions due to secondary infections. The feet and face are most commonly affected. The diagnosis is made on a deep skin scrape or biopsy. A skin scrape is a very quick procedure and involves scrapping the skin until a small amount of blood is seen. Sometimes multiple scrapes have to be made to find the parasites because they live deep inside the hair follicles. The material obtained is looked at under a microscope. The mites are easily identified by their distinct shape. The mite is sometimes described as resembling a crocodile or cigar. It has an elongated body with short legs. As described before, juvenile onset, localised demodex usually resolves without treatment. Juvenile onset generalised and adult onset localised and generalised demodex needs to be treated. Treatment may include an oral or injectable antiparasiticide. The most commonly used product is ivermectin, a macrocyclic lactone. This product is actually a product registered for use in cattle and sheep and is not registered for use in dogs but it has been found to be effective and is safe (except in the Collie breeds) if it is correctly tapered up to the effective dose. Collie and Collie crossbreeds cannot always metabolise the drug, so it is important that the safety in these dogs is tested before starting treatment. This is done by testing the blood for the presence of the MDR gene. The test will need to be sent off. The vet will recommend testing these breeds before starting any treatment. Treatment is continued for twice as long as it took to clear the infection and your pet will require regular check ups and skin scrapes. So if the infection took one month to clear, treatment will continue for another month. The vet may also recommend using a dip in some severe cases. The dip will more often than not contain amitraz. Amitraz can be toxic so it is important to follow the instructions when mixing up the dip. It is also toxic to cats so care should be taken when you have a household with both cats and dogs. There are also some spot on treatments available which have been registered to treat demodex in dogs. They also contain Amitraz. It is usually recommended to do six weekly treatments but this will depend on the severity of the infection and the judgement of the vet in each individual case. Demodex is rarely diagnosed in cats. More often than not, if it is diagnosed, there is an underlying condition affecting the immune system. Feline immunodeficiency virus (FIV), Feline Leukaemia virus (FeLV), Diabetes Mellitus and cancer can predispose the cat to developing demodex. It is most commonly seen on the face and ears and presents as generalised hairloss on the head and neck with crusting and potential secondary infection. It can affect the eyelids and the region around the eyes and ear canal is often affected. Cats can be infected with two different types of demodex, of which one is contagious and can be passed on to other cats. As Amitraz is toxic to cats, the condition is treated with Macrocyclic Lactones or sulphur lime. Because the condition is often due to the presence of an immunosuppresive disease, cats will often require life long treatment. Demodex is a relatively common condition in dogs and more rarely seen in cats. It is generally an easily identifiable condition and in most cases is easily treatable. Treatment does however require dedication from the owner, particularly when it occurs in adult dogs and cats. In adult onset demodicosis it is important to try and manage any underlying conditions, maintain nutrition and reduce any stressful situations. Even in these cases, demodex can be managed and your pet can lead a normal and happy life.